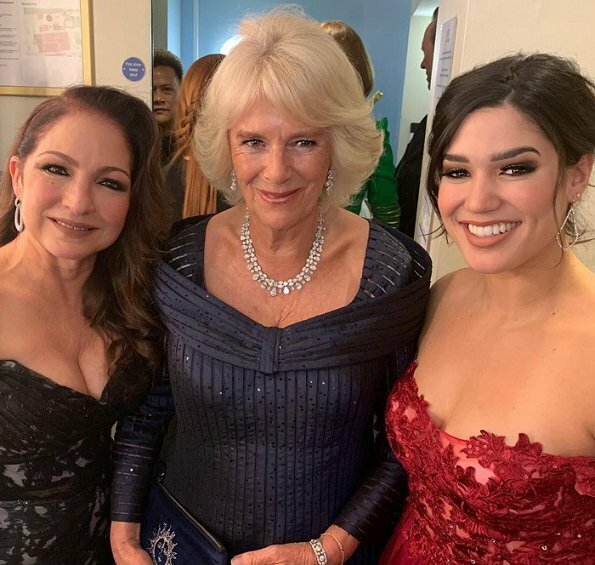 On April 7, 2019, The Duchess of Cornwall attended the Olivier Awards 2019 at the Royal Albert Hall in London. 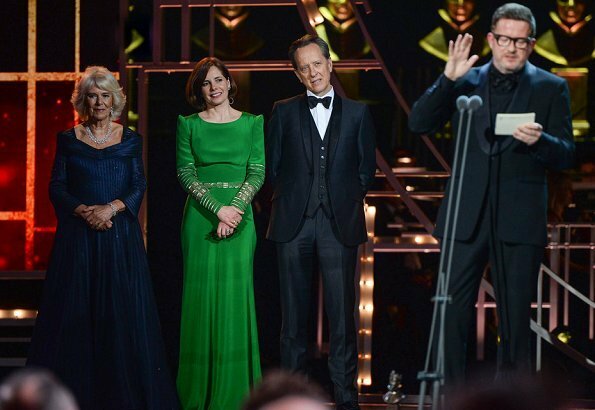 The Duchess presented 2019 Special Award to choreographer and director Sir Matthew Bourne. 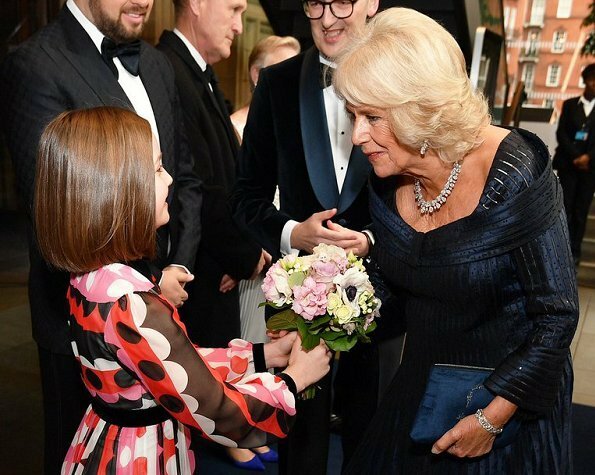 The Duchess of Cornwall congratulated Olivier Award winners in London following a night celebrating London theatre. 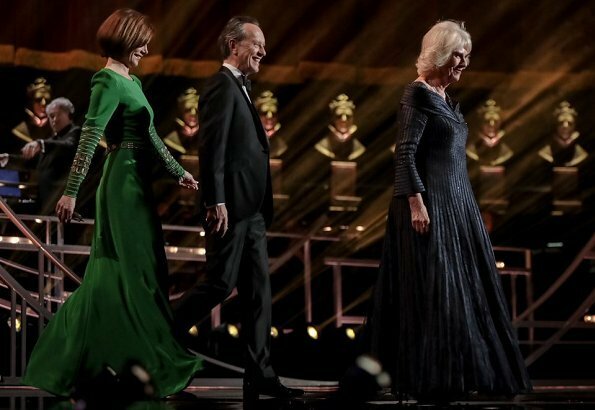 Established in 1976, the Olivier Awards celebrate the world-class status of London theatre, and are Britain’s most prestigious stage honours. 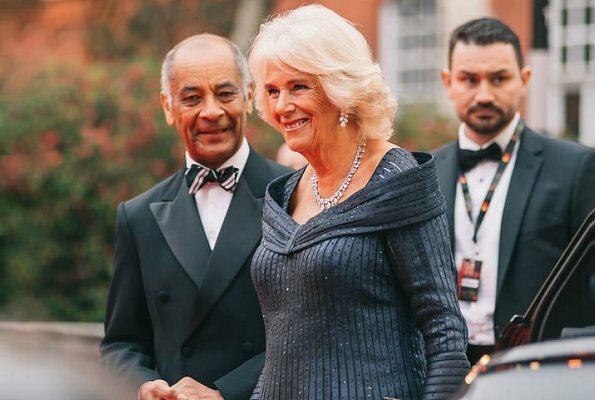 Duchess of Cornwall looks beautiful the dress is so vibrant;the necklace and earrings are particularly striking. This is a glanorous event and she is wearing a glamorous dress. It has such marvelous details like the bandeau around the neck and at the end of the sleeves. I’m sure when she walks the hem flutters around. And midnight blue shows off diamonds perfectly and she has chosen the perfect ones. The fabric is fantastic: a little bit of shine and glitter, and we know how vertical lines make us look taller and thinner. Hair and makeup are spot on. To me this is as good as it gets. Agree with you. She looks great here and the dress is beautiful. This gown is incredibly flattering on her figure. Fabulous diamonds, great hair, might I add, amazing complexion and skin finish off this look perfectly. Charmante Duchesse de Cornouailles parfaite dans son job ! Prachtig dat blauwe kleede, chique chique, kan het niet meer benadrukken, Camilla heeft heel goede smaak. Yes, but I like your Queen too! I like this dress, color, shape, it's really nice. The most elegant royal of the weekend ! Perfect ! The dutchess looks lovely. Dark blue suits her and the dress fits well. 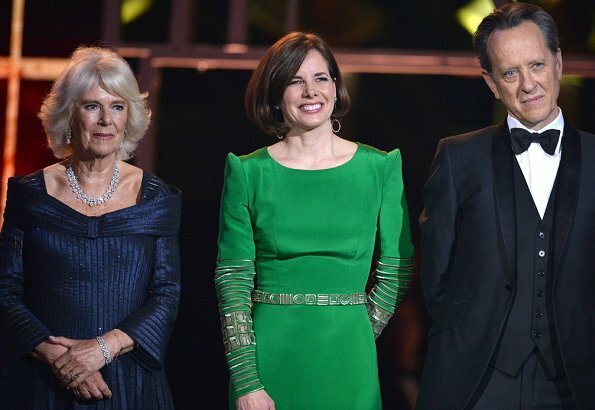 By the way: Who is the lady in the green dress? Does anybody know? Darcey Bussell, retired ballet dancer, according to Daily Mail. Dame Darcey Bussell. Retired English ballerina. Beautiful dress - very flattering and stylish. 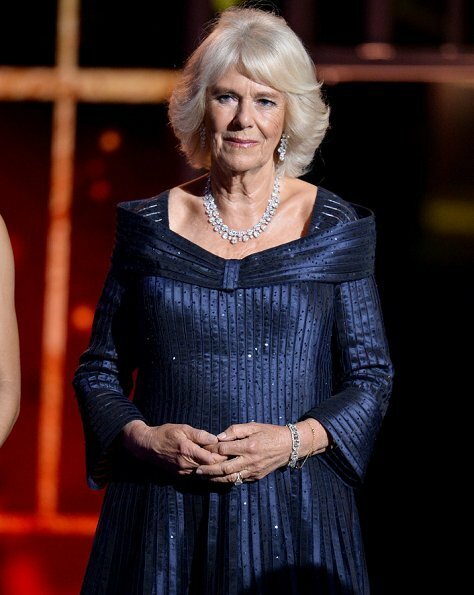 Camilla looks great. This is a dress I like. 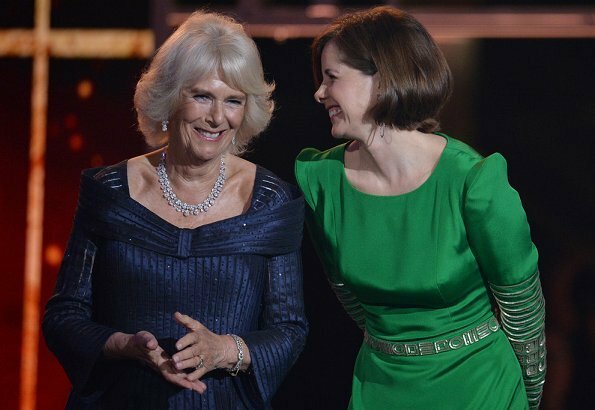 Most of Camilla's clothes are not to my liking, and I don't find them terribly flattering, but this is lovely. 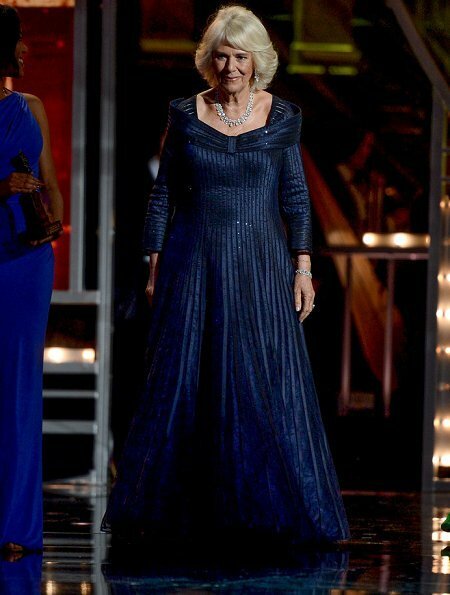 Dss Camilla looks classy. Beautiful color of this gown. Agree with all comments above. Dress fits beautifully and is a gorgeous colour. She looks wonderful. 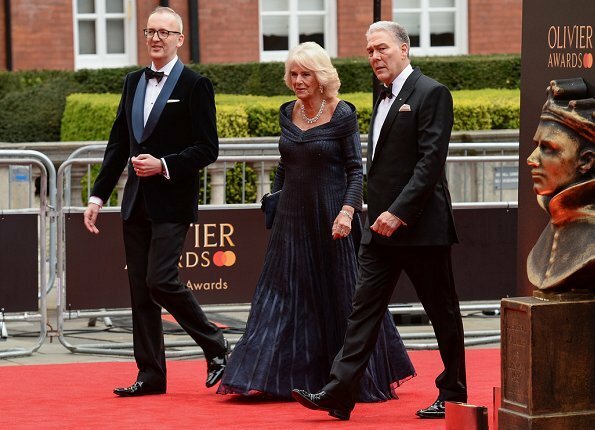 WOW … Duchess Camilla looks absolutely amazing, the dress: one of her most beautiful ever <3 ! Quite a feat to look so elegant next to Darcey Bussell. I am impressed. Quite a feat to look so elegant next to Darcey Bussell. I am impressed with Camilla. Best look on her since the marriage blessing. I love how Camilla dresses for her shape. She has a great stylist and seamstress in my opinion.